Illustration of the twin spacecraft of the NASA/German Research Centre for Geosciences (GFZ) Gravity Recovery and Climate Experiment Follow-On (GRACE-FO) mission. Image courtesy of NASA/JPL-Caltech. The Gravity Recovery and Climate Experiment Follow-On (GRACE-FO) twin satellite mission is scheduled for launch on Monday, 21st May, from the Vandenberg Air Force Base in California. It will be aboard the SpaceX Falcon 9 rocket, alongside a number of commercial satellites. As its name suggests, GRACE-FO is a follow on to the original GRACE mission which was launched in 2002 and reached end of life in November 2017. Both missions use innovative microwave measurement techniques to map deviations in the Earth’s gravity fields, which in turn enable changes in the oceans, ice sheets and land masses to be monitored. Both the original, and follow on, are joint missions between NASA and the German Research Centre for Geosciences (GFZ). 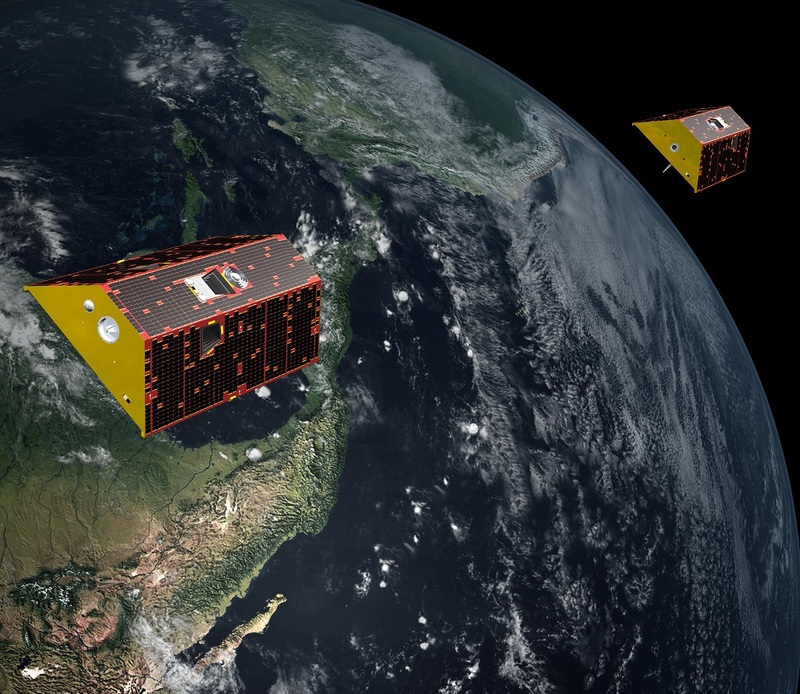 Each of GRACE-FO’s identical satellites weigh around 600 kg and measure approximately 3 m x 2 m x 0.8 m. They’ll be launched into low Earth circular polar orbits at around 490 km altitude, separated by between 170 and 270 km and to maintain this distance will require regular orbital moves during the mission life. Loss of groundwater in California. Microwave Instrument (MWI): this sends K and Ka band microwave signals between the two satellites to precisely measure their distance apart. Its reported that they are accurate to one micron – the diameter of a blood vessel! Laser ranging interferometer (LRI): This experimental instrument is an addition to the original GRACE mission and makes the same measurement as the MWI, but using lasers instead. It’s estimated that this could improve accuracy by at least a factor of 10. Accelerometer: Measures the factors other than gravity affecting the satellite orbits. GPS Receivers: Determine the exact position over the Earth to within a centimetre. GRACE-FO will operate on a decaying orbit and so will not have constant repeating ground-track, but it should map the globe every thirty days. In addition, it will produce hundreds of daily profiles of temperature and water vapour. GRACE produced some fascinating insights during its fifteen year mission; it had been hoped that the two missions would be in space together to allow for calibration between them, but this was not possible. Scientists are itching to get new data from GRACE-FO following the six month gap and it’s hoped that the new pair will provide further insights into how the world’s climate is changing, the loss of the ice sheets and monitoring how much water we’re currently using – all of which could have major impacts on our future! This entry was posted in Data, Earth Observation, NASA, Oceans, Remote Sensing, Satellite, Space Industry and tagged Acclerometer, Earth, Earth Observation, German Research Centre for Geosciences, GPS Receivers, GRACE, GRACE-FO, gravitational fields, Gravity, Gravity Recovery And Climate Experiment Follow On, how does GRACE-FO work, ice sheets, laser, Laser Ranging interferometer, LRI, maps, measurement, microwave, Microwave Instrument, MWI, NASA, oceans, orbits, remote sensing, satellite, twin satellites, what is GRACE-FO by Andy. Bookmark the permalink.